Around your third month of pregnancy, and continuing through the early days of breastfeeding, your breasts will produce colostrum, a special type of breastmilk for your newborn baby. But what exactly is colostrum? Colostrum is the first type of milk that your breasts make. It is a thick and sticky liquid that has a yellowish to orange color. During the last few months of pregnancy, you may even begin to leak a small amount of this thick yellowish substance. But do not worry if you are seeing this sooner or aren’t seeing any at all. Some women start to leak earlier and some women never leak. What is colostrum made of? How does it affect my baby? Colostrum is high in protein, carbohydrates, immunoglobulins, and antibodies. It is also low in fat. It truly is the perfect first food for your baby because it is extremely easy to digest and it keeps your baby healthy. How does it do that? It contains high concentrations of leukocytes, protective white blood cells which can destroy disease-causing bacteria and viruses. (The concentration of immune factors is much higher in colostrum than in mature milk.) Colostrum also has a laxative effect that helps babies expel the tarry first stools called meconium. This aids in the excretion of excess bilirubin and helps prevent jaundice. What I find fascinating about colostrum is that it provides perfect nutrition tailored to your baby’s needs. When you feed your baby colostrum, it’s as though you’re giving him his first vaccination. It contains large quantities of an antibody called secretory immunoglobulin A (IgA). This is the first time your baby receives this antibody. Before he was born, he received a different antibody, called IgG, through your placenta–it worked through your baby’s circulatory system. After birth, he benefits from the antibody IgA, which protects your baby in the places most likely to come under attack from germs–the mucous membranes in the throat, lungs, and intestines. Your baby’s intestines are very porous and absorbent, and colostrum plays an important role in protecting them. Colostrum essentially seals the holes in the gastrointestinal tract with a barrier which prevents foreign substances from penetrating and possibly sensitizing your baby to foods that you have eaten. As you can see, colostrum is a miracle food. It was once estimated that if human colostrum could be commercially manufactured with all the same antibodies and immunoglobulins in it (unfortunately this is impossible) it would cost somewhere around $80 an ounce. It’s pretty incredible! We now understand why colostrum is often referred to as “liquid gold.” Because it is! How much colostrum will I make? On day one, your baby’s stomach capacity is about 5-7 ml, or about the size of a marble or cherry. Very small. Researches discovered that the walls of a newborn’s little stomach stay firm so it will not stretch to accommodate more milk. This is why extra milk given to baby will be pushed back out–spit up. So you needn’t worry about your small amount of colostrum. It is just the right amount for your baby’s first feedings! 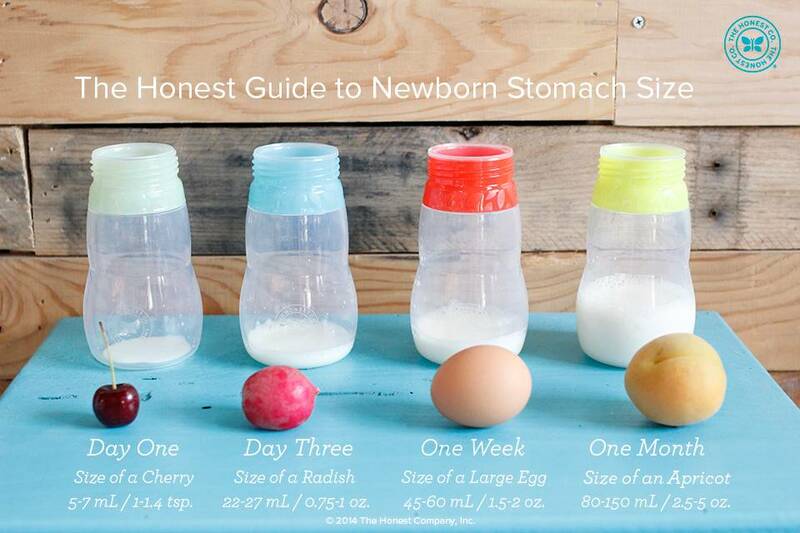 Your newborn’s stomach capacity will grown to about 0.75-1 oz, or about the size of a “shooter” marble or a radish. Because baby’s tummy is so small he will demand small, frequent feedings. Bringing him to the breast regularly will assure that your baby is taking in all the milk he needs. Your baby’s stomach capacity on day seven is about 1.5-2 oz, or about the size of a ping-pong ball or an egg. Continue those frequent feedings! It will help your milk production increase and meet baby’s demands. You will notice that over the first two weeks your colostrum will gradually change to mature milk. It will begin to appear thinner and whiter (or more opaque) in color. During this transition, the concentrations of the antibodies in your milk decrease, but your milk volume increases, so it evens out. Those disease-fighting properties of human milk do not disappear after your colostrum goes away and your mature milk comes in. In fact, as long as your baby receives your breastmilk, he will receive immunological protection against many different viruses and bacteria. This is why it is extremely important to breastfeed your newborn at least 8-12 times every 24 hours in those first few days, allowing your baby to get all the benefits of the colostrum, preventing engorgement, and stimulating production of a plentiful supply of mature milk. Breastfeeding Nutrition: How Many Extra Calories Do You Really Need?